The most widely-accredited pre-election predictions of the outcome were that there would most likely be a hung parliament but that an overall majority for the centre right was possible. Either way, it appeared that Silvio Berlusconi and Forza Italia (FI) stood a good chance of being back as the driving force in Italian politics after the vote; for if no party or coalition seemed likely to be able to form the next government on its own, then the only viable alternative appeared to be a grand coalition involving an arrangement between FI and the Democratic Party. In the event, expectations were both fully met and completely belied. On the one hand, the centre right took a share of the vote exactly equivalent to its pre-election poll average. 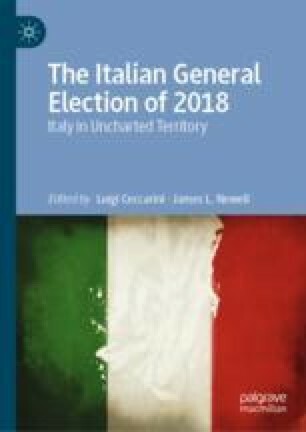 On the other hand, the unexpected redistribution of support that took place, within the coalition, from FI to the League, led to Berlusconi’s political marginalisation. This chapter seeks to make sense of this dual outcome by considering the voting shifts that underlay it; the strategic decisions made by the party leaders in the run-up to the election; and the ‘opportunity structure’ to which the party leaders sought to respond. Saviano, Carmine. (2018). Elezioni, al via il silenzio dei sondaggi: le ultime rilevazioni certificano lo stallo. la Repubblica, 16 February. https://www.repubblica.it/politica/2018/02/16/news/ultimi_sondaggi-189007345/.